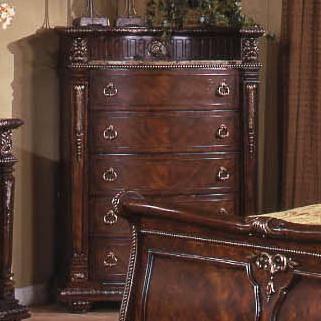 This five-drawer dresser has an appealing traditional elegance that will make a statement in any decor. 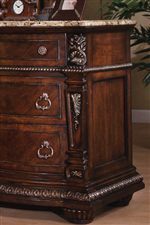 Features including an embossed gallery with a laminated marble top, detailed pilasters, and elegant beading gives this dresser its beautiful style. 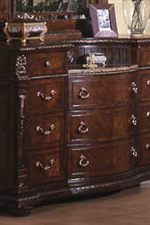 The drawers have bowed fronts, are accented with antique, brass finished hardware, and feature felt-lined top drawers, all adhering to the chest's traditional appeal. 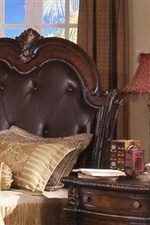 With a brown cherry finish, this chest offers convenient storage, making it a great addition for any room. 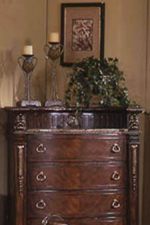 The Coventry Traditional 5-Drawer Chest with Bowed Drawer Fronts and Laminated Marble Top by Holland House at Miskelly Furniture in the Jackson, Pearl, Madison, Ridgeland, Flowood Mississippi area. Product availability may vary. Contact us for the most current availability on this product.